Missing a year in your collection? Perfect for filling in the gaps, this serene design by artist Barbara Wilson features a charming winter village scene with a woodcut full moon. Perfect for wall or table display. So happy for the opportunity to fill for a year that I missed with this open date Christmas frame. I chose 2011. Just wish that a new open date frame was offered every year so I could fill in more than just one year. Still missing 2009 and 2012. I love this Open Date frame! I began purchasing the hand-painted Christmas frames in 1998. I missed a couple of years, as they were sold out of the frame. Last year I was able to buy a frame for one of the missing years. I would love to fill in my other missing years, but would love a different frame, since my missing years are consecutive. This is such a great idea! Please continue it. Love Love Love Open Date Calendar! I have been buying these frames for over 20 years! I missed a couple before I started buying/collecting them. So happy whoever thought of Open End date! Genius! THANK YOU for creating this!!!!! I just ordered this frame for the 2014 year since the 2014 frame is currently unavailable!!! I am so excited that you have offered this! I do know some friends who have missed years and I have sent them this so they know that now they don't have to have holes in their collection!!!! PLEASE never get ride of this option!!!!! What a wonderful option for your loyal customers who order every year but sometimes might be too late and miss out!!!! I can not wait to get my frames!!!! (I also ordered the Halloween one!!) :0) thanks for providing such a great product and now making it even better with this option!! You have me as a customer for life!!! Such a beautiful frame. This is the second frame I’ve ordered. Love it!! Very colorful and it could be personalized. I have these frames beginning in the year 1994. My children really look forward to displaying them at the holidays. I’m buying the earlier missing years. I purchase this frame every year - it has become a tradition to capture my girls' picture each Christmas. Such nice memories as we unpack and display our Christmas pictures each year that are a part of our Christmas decorations. Missing 2 years. Now only one year... 2003. Will you have another style next year for an Open Date Christmas frame?? Excellent opportunity to fill in a few of the missing years and add to my collection! Our collection goes back to 1997 but we missed last year. its been a family tradition to buy these frames for almost 20 year! I love these frames! i buy one every year and put the family picture it! So Fun!! i order three each year and have for ten years for my three children and their families. We love them. Because I collect them every year to display a holiday photo of my daughter. This is my favorite Christmas scene and the artwork looks beautiful! I appreciate the quality of these frames and I always frame a family Christmas picture and have the year makes the picture even more special. We were missing 2003 and now have a complete set from 1998! It is a joy to put this collection out at Christmas and the memories put smiles on all of our faces. I am missing a year! i AM LOOKING FOR FRAMES FOR YEARS i AM MISSING. ALSO, HOPING THAT THE FILLED IN YEAR WILL NOT LOOK LIKE WHAT WAS ON THE MOCKUP! Beautiful quality! Wonderful idea to add any year- very thoughtful to your customers! Because I forgot to order last years frame and I have the last 10 years so I wanted to continue with the series. I forgot to order last years frame and missing it in our collection. Thank you for providing this item! I have been buying the frames for years and I missed 2017. It's nice to be able to personalize the year you missed! I have been collecting these frames every year and it's such a joy to see our Christmas traditions each year. I am missing some years from my collection and this is a great option to fill in! For some reason I forgot to order the 2017 frame and this was a great option. I collect 'twas the night before Christmas theme, I love this frame. I chose this because a friend got me the Christmas 2015 frame this year and I love it and the idea of it. I have 2 sons, one of which had his first Christmas last year. I wanted to start a tradition with me and my boys. A seasoned mom and professional photographer told me years ago that of all of her Christmas traditions, this is her most treasured: having an annual photo of her children in an Exposures frame to collect and display at Christmas Now I too treasure this tradition, but we didn't start collecting them until a year after my first child was born. I chose this frame and personalized it with our missing year! Do you plan to offer additional versions of this "blank date" frame in the future? I have a few missing years, would be fun to have different versions. BEST ANSWER: Thank you for your question. We are planning on having the Open date frame next year. However the design is not yet known for this coming season. We hope this information will be of help to you. BEST ANSWER: Thank you for your question. Yes, when ordering this frame you may choose which year you would like personalized on this frame. We hope this information will be of help to you. I’d like to order 3 frames with “Christmas” written in but still have space for the missing year to be added as needed? BEST ANSWER: Thank you for your question. Unfortunately we can not have just Christmas printed on it, it can only be blank or have Christmas with a year printed. We apologize for any inconvenience. BEST ANSWER: Thank you for your question. Unfortunately, we do not have an open date Halloween frame at this time. We hope this information will be of help to you. BEST ANSWER: Thank you for your question. Yes, you may choose what year you would like printed on this frame. We hope this information will be of help to you. Is this design the same as a design from another year or is it completely unique? Last year I ordered the plain hand painted Christmas frame, only to discover when I unpacked all my other years that it was exactly the same as another year. I am missing 2003 and don't want one that I have to write on that is the same as another year. Can you let me know so I don't have to unpack all my frames before ordering? Thank you. BEST ANSWER: Thank you for your question. 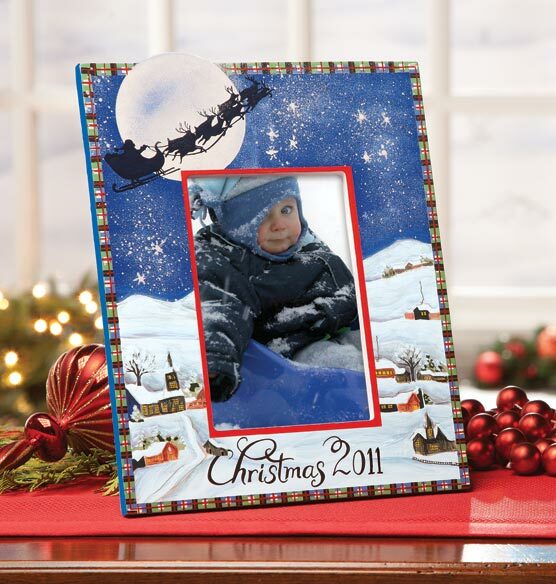 The Open Date Christmas Frame is a new design, it has not been used for a past year. We hope this information will be of help to you. Thank you for your question. We started selling the Christmas frame in 1995 and the Halloween frame in 2004. I have Halloween back to 2004, but I am pretty sure I have XMAS frames a bit longer. I think I have them from 1996 on. What size photo fits in these frames? BEST ANSWER: Thank you for your question. This will fit a 4x6 photo. We hope this information will be of help to you. can I get the 2013 open date frame? BEST ANSWER: Thank you for your question. The Open date ornament is for any year you may be missing. So it can be for 2000, 2004 or for 2013. We hope this information will be of help to you. Is it possible to get the year 1999 on the open date frames? BEST ANSWER: Thank you for your question. It is possible, you can type in 1999 or 99 and our personalization department will personalize the frame with 1999. We hope this information will be of help to you. We are missing Christmas 2005, do you have available or does this "open date Christmas Frame" truly come with no date? BEST ANSWER: Thank you for your question. We do not have any 2005 frames. You can purchase the open date frame and have it personalize with 2005. We can personalize it with any dates. We hope this information will be of help to you. Can I get this frame with no date on it at all? BEST ANSWER: Thank you for your question. The frame does not have to have a date. You can decline the personalization. We hope this information will be of help to you. I could use a few more of the open date frames. Do you have any other design options? I already have the one pictured above. Thanks! BEST ANSWER: Thank you for your question. We do not carry a different design. We will pass along the suggestion. We hope this information will be of help to you. This says open date picture frame but then picture has 2011 and 2007 Do you tell Exposures what date you want painted on the frame or how does this work ? BEST ANSWER: Thank you for your question. Yes, you may request which year you would like personalized on this frame. We hope this information will be of help to you. When I order this frame it does not let me know if it is horizontal or vertical in the checkout bag. How can I (and you) tell? The order number is the same for both. I want the horizontal frame and am worried the wrong one will be sent to me. Thx. BEST ANSWER: Thank you for your question. Before adding this item to your shopping bag you must select from the drop down box horizontal or vertical to choose which style you would like. We hope this information will be of help to you.